Sealaska Heritage Institute (SHI) has published a book of old, rare and priceless photographs of Inupiat life in the early twentieth century made by an Inupiat photographer and teacher. 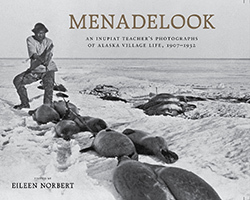 The book, Menadelook: An Inupiat Teacher’s Photographs of Alaska Village Life, 1907-1932, showcases nearly one hundred photographs by Inupiat Charles Menadelook that document life in Kingigin (Wales) in the Bering Strait between Alaska and Russia. The book, which was compiled and written by Menadelook’s granddaughter, provides a singular view into the Inupiat world during the early twentieth century and gives both a pictorial and Native perspective on Inupiat traditions and historical events, said SHI President Rosita Worl, noting the book stems from SHI’s advocacy program, which is part of SHI’s effort to promote Alaska Native arts, cultures, history and education statewide. Charles Menadelook was born in Wales, Alaska, in 1892. One of the first Alaskan Natives to become a teacher, he taught in Diomede, Shishmaref, Shaktoolik, Kotzebue, Noatak, Sinuk, Nome, Gambell, and Unalaska. He also became an avid photographer, capturing a time of Inupiat history and activities that, up to that time, had been passed down through Elders’ fond memories. The book was compiled and written by Menadelook’s granddaughter, Eileen Norbert, who asked her sister, Rose, to send family photos to her while she was living out of state. Her sister sent a collection that included photographs taken by their grandfather. When Norbert was a student majoring in anthropology at the University of Alaska Anchorage, it soon became apparent to her that her grandfather’s collection was an historic treasure, and for more than thirty years she meticulously researched and recorded the stories behind the photographs. The text is based on interviews with Menadelook’s children, his sister, other relatives, former students and Elders, as well as school reports, correspondence and other materials. Menadelook photographed a wide range of activities, including numerous subsistence scenes. One photo shows a hunter catching birds with a long-handled net while another shows men and children looking over a harvest of murre eggs. One photo shows an umiaq filled with seals while another shows people building a new sod shelter. The book is divided into sections on Menadelook’s family, growing up—which discusses marriage customs, reindeer fairs and Western influences—and Menadelook’s teaching career in nine villages. The book was published in association with the University of Washington Press. It includes a foreword by Worl and features photo restoration by Brian Wallace. The book will be carried in stores and also may be purchased through the Sealaska Heritage Store in Juneau and through Norbert, who will give a presentation on the book on Oct. 30 at the Katirvik Cultural Center in Nome.